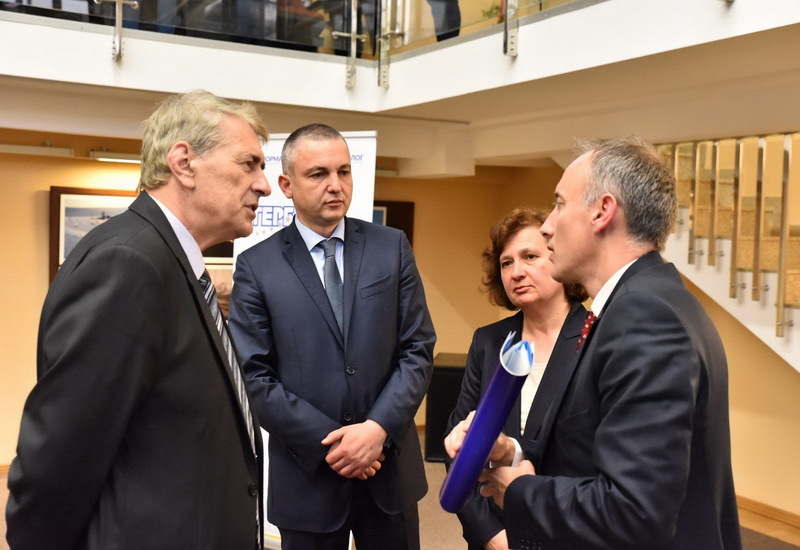 On 02.04.2019 was held a Discussion Forum on the Development of Education in Varna under the motto “Europe in our Home”. It included the Minister of Education and Science – Mr.Krasimir Valchev, members of the 44th National Assembly, the District Governor of Varna District – Mr.Stoyan Pasev, the Mayor of Varna Municipality – Mr.Ivan Portnih, Rectors of Higher Education Institutions, Directors of Schools and other Institutions working in the field of education in Varna. “We are pursuing a consistent policy of increasing the Admission in Higher Education Institutions in the areas with expected labor market shortages – pedagogical, engineering, natural-mathematical and agrarian”, said the Minister of Education, presenting the work of the Ministry on synchronization of programs offered from higher education institutions with the needs of the labor market. After the end of the forum the Rector of Technical University of Varna – Prof. Ventsislav Valchev along with the Minister of Education and Science – Mr.Krassimir Valchev and the Mayor of Varna Municipality – Mr. Ivan Portnih discussed as well the general problems of Higher education and the specific initiatives and events related to the development of the Technical University of Varna.